It is advisable to supply potassium and trace elements needed for healthy growth of aquatic plants by using liquid fertilizer. It is effective to supply nutrients that often become insufficient in an aquarium on a daily basis as these elements are quickly absorbed by aquatic plants. Let’s do a research on what is provided by liquid fertilizers. 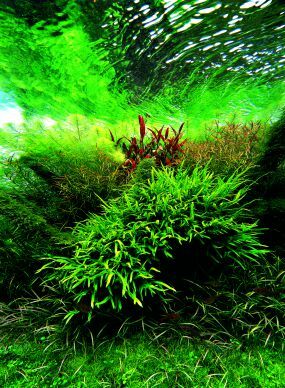 In addition to CO2 used for photosynthesis, nutrients including nitrogen, phosphorus, and potassium and trace elements such as iron are necessary for growth of aquatic plants. 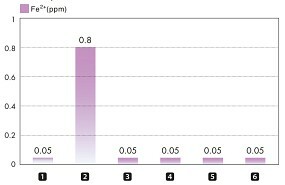 Although these elements are supplied by the substrate and produced by fish waste products, the absolute amount of potassium and trace elements is small. Thus these elements tend to be scarce in planted aquarium. That is why a daily application of liquid fertilizers is important. With liquid fertilizers, potassium and trace elements are directly supplied into aquarium water and absorbed through the plant leaves, which provide instant results. This section reviews the research on the changes in planted aquariums with the application of liquid fertilizers. 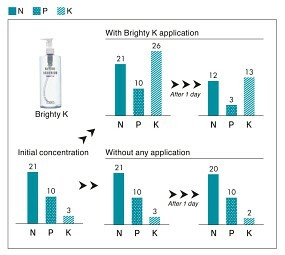 Measurement of each parameter cannot be performed with the agent used due to extremely low concentration in case, that the specified dosage is directly applied to an aquarium. For this reason, the concentration is increased to 100 times of the original concentration in this comparison for experimental purposes. 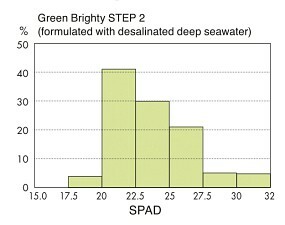 ADA Green Brighty STEP 2 contains rich bivalent iron (Fe²+) that can be absorbed by aquatic plants. COD also responds to trace elements which are easily oxidized. 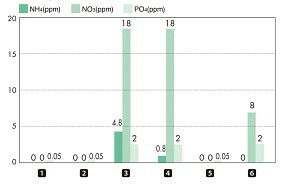 A higher COD level shows a larger amount of trace elements contained. TDS shows electrical conductivity. 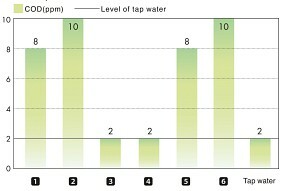 TDS value increases in response to potassium. It is found that ADA Green Brighty Special LIGHTS particularly contains high amounts of nitrogen and phosphate. 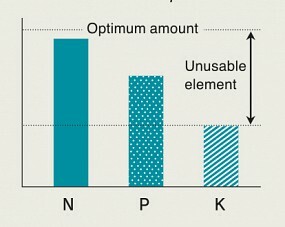 Absorption of nutrients is limited by the least available nutrient (i.e., potassium in this case). 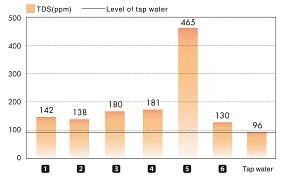 It is verified that excessive nitrogen and phosphorus is absorbed by aquatic plants as a result of adding potassium that is insufficient. The Green Brighty series formulated with desalinated deep seawater contains rich minerals and has effects of enriching the plant leaf colors. 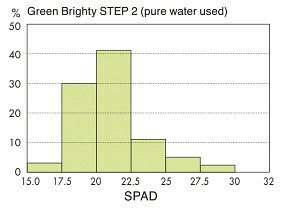 SPAD shows the foliar chlorophyll concentration. This is the Key Point!